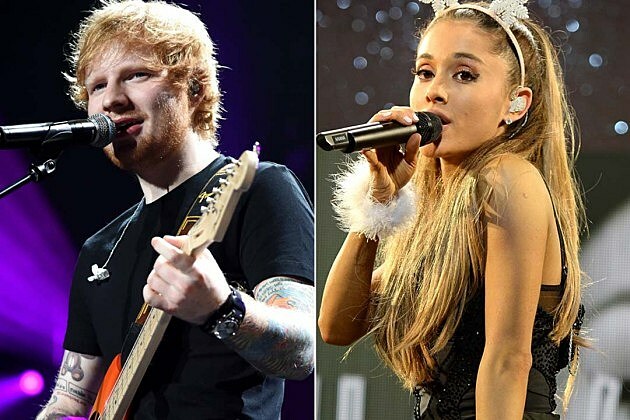 The 2015 Grammy performance announcements are trickling in — and Ed Sheeran and Ariana Grande are slated to perform! According to the Hollywood Reporter, the Grammys announced that Sheeran and Grande — both nominees themselves — will perform at the ceremony. Madonna, AC/DC and Eric Church are also some of the first performers to be announced. Sheeran is up for three awards on Music’s Biggest Night, including the awards’ most prestigious honor, Album of the Year, for ‘X.’ Grande is up for two awards herself: Best Pop Vocal Album for ‘My Everything,’ as well as Best Pop Duo/Group Performance for ‘Bang Bang’ with Jessie J and Nicki Minaj. While we’re rooting for wins for both the ‘Don’t’ and ‘Problem’ singers, we also know that no matter what, they’ll deliver totally kickass performances. (We’re already dreaming of the romance that will undoubtedly be ‘Thinking Out Loud’ live.) Sigh. To watch Ed Sheeran and Ariana Grande’s Grammys performances, don’t forget to tune into the 2015 Grammy Awards on Feb. 8 on CBS.